Today's mani was inspired two-fold! Firstly, the design came from the talented Pshiiit blog. Normally I don't bother checking out blogs that aren't in English because the translation tools are terrible but you really should check this one out - her designs are sublime and her photos have a very ethereal feel to them! 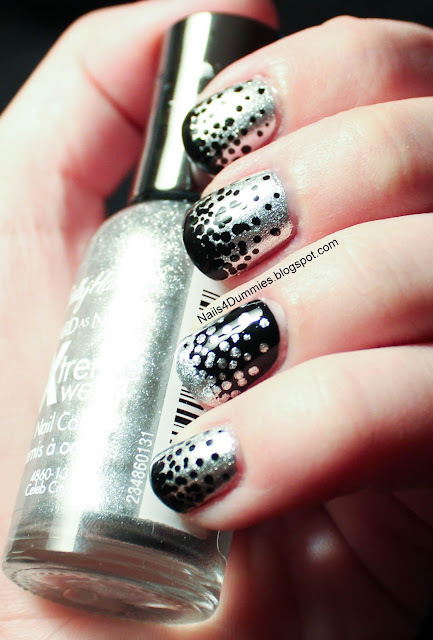 My second inspiration comes from the lovely Marta from over at Chit Chat Nails! She has such a sophisticated aesthetic that I find very beautiful but I tend to lean towards bright and whimsical! Be as that may, this felt very "Marta," to me! The polishes are Sally Hansen Hard As Nails in Black Heart and Sally Hansen Xtreme Wear in Celeb City! I'm very much in love with this one, what do you think, is it me? Oh my this is prettay. Lol, thanks Jazz, I'm really loving this look! That is fabulous. I thought they were those stick on nail wraps!!! Thanks Roisin! Tee-hee, I'm glad you like it! i ve just came across to your blog and i love love your nails:-)!! Thanks so much, I'm glad you like it, welcome, welcome, welcome!! Seriously, every time I do a dot gradient it turns out looking like poop. I can never achieve the look you got! seriously, this is perfect! I'm jealous! It's gorgeous! I especially love the accent nail! So subtle! Lindsey, This is so awesome!